Breadcrumbs Manager - Joomla breadcrumbs(pathway) management system. Content Enhancer - Joomla extension that allows automatic content replacements and content variables. Title Manager - Joomla page title management system. Advanced Contexts Manager is a native Joomla 1.5 extension that allows you to define different contexts in your web site. A “context”, as we call it, is nothing more than a part of your web site that satisfies some conditions. Those conditions are evaluated at runtime and the context is marked as active or inactive. The interesting thing about contexts is what you can do, once you define them. You can alter a module’s parameters based on the currently active web site context(s). This feature has many possible uses. Based on the current context you could: set different module class suffixes, render news from different sections, and many more. Basically, anything that the module allows to be set could be made dependent on the context. You no longer need different modules that do almost the same thing. Even more, you could have dynamic parameters by using request or session variables in parameter values. Randomizing a module parameter is also a possibility*. Joomla only allows setting module visibility based on the currently active menu item. There are many scenarios where this is not sufficient. With Advanced Contexts Manager you could define module visibility based on the currently active context(s). This is far more advanced and gives you full control over where a module is displayed. There are many other cases where contexts will prove handy. 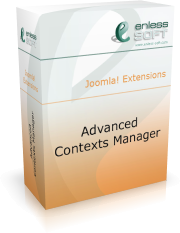 We provide other Joomla extensions that benefit from their integration with Advanced Contexts Manager. For more information, see related products. Aside from our own products, we consider it important to give other developers the ability to extend what we have implemented. This means that Advanced Contexts Manager has extension points and you could adjust it to your own needs, if necessary. If you are uncertain whether a web site feature you need could be implemented or made easier/cleaner using Advanced Contexts Manager, don’t hesitate to ask us. * Only possible if you have Enless Soft Content Enhancer extension.